Adopting a female chocolate lab-mix approximately 9-10 months of age. Brought into the local SPCA shelter (stray). Timid temperament (no doubt this dog was mistreated) but otherwise very sweet disposition. She's being spayed tonight and bringing her home tomorrow. Dog has no name yet but tentatively her name will be "Hershey". Here name is officially "Abby". That is going to be one spastic dog. 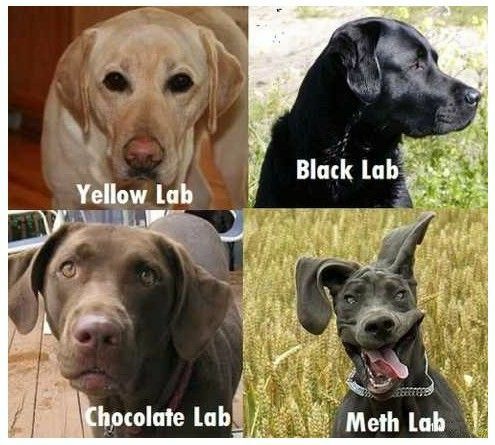 So.. a silver lab then? 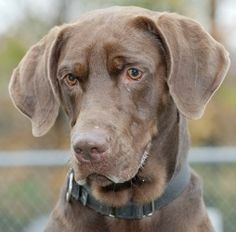 Adopting a female chocolate lab-Weimaraner mix approximately 9-10 months of age. You Sir, have earned one less turn on the Karmic wheel as a cockroach, and gained a true friend and companion for life. Good on you, and your new buddy. My wife that it looks like a dog that should have a "real" name. Not a "spot" or "honey bear"
Sam says hi! He came from the SPCA too, just last week. He is an awesome boy - calm, happy, loving and house trained, Sam is glad you adopted from the SPCA because it's full of lonesome doggies and kitties who need a forever home. Time for a biscuit! Her homecoming was extended a day because of her spaying (required by state law for shelter adoptions). She did recon on the back yard then spent the entire afternoon lying in the shade under a tree and catching the spring breeze. Took a bit of coaxing to get her into the back porch sunroom where she's been content to stay. She's very tired. I don't think she's ever been inside before. She has been crowned "Abbie" which wasn't my choice (Daisy) but not as hackneyed and lame as "Bella" to which I said "aw hell, no". A friend of mine had a Weim named Hershey. He was a great dog. What's the mix on that? Do they know? I've got money saying its part GSMD. She will get the drift soon enough. Let me guess why you called him Sam. That look on his face! In for The Big Tired I'm going to have to post some outside pics of her esp. when she's up on all fours. These "lying down" pics are too "Labrador" when in fact she looks more "pointer" than "retriever". I suppose a Woods Panel will tell otherwise. Let's see your war face!!!! Sam reminds me of "Lafayette" (voiced by actor George "Goober" Lindsey) from the 1970 film "The Aristocats"
The amusing motorcycle chase scene. The bloodhound, "Napoleon" was voiced by Pat Buttram aka "Mr Haney" from "Green Acres": The leg-chewing scene cracks me up. Rescue and shelter dags are best dags. Abby started "Positive Dog Training" at PETCO last week and has been doing pretty well. We have learned that she was likely used as a dog-fighting "bait dog" then dumped off when she became big enough to fight back. She has a huge bite scar on her left hind leg along with other smaller scars. She's also extremely aggressive toward larger dogs (but seems to love smaller dogs, cats, and people including children). She's also skittish about getting into and out of the car. And she's starting to pull like all hell when walked on a leash. Hopefully the dog training will address these issues. She's really started to come out of her shell over the past couple of weeks.